The AT&T Global Network Client allows Mac OS devices to easily access the Internet and your company’s private network from all over the world. It provides a simple, powerful interface that automatically detects and connects over cellular, Wi-Fi, and broadband networks. Do not move the AT&T Global Network Client folder to the trash. 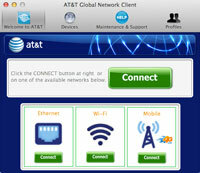 Use the AT&T Global Network Client Uninstaller app or allow the installer to upgrade the application. Apple, the Apple logo, iPhone, iPad, iPod touch, and iTunes are trademarks of Apple Inc., registered in the U.S. and other countries.